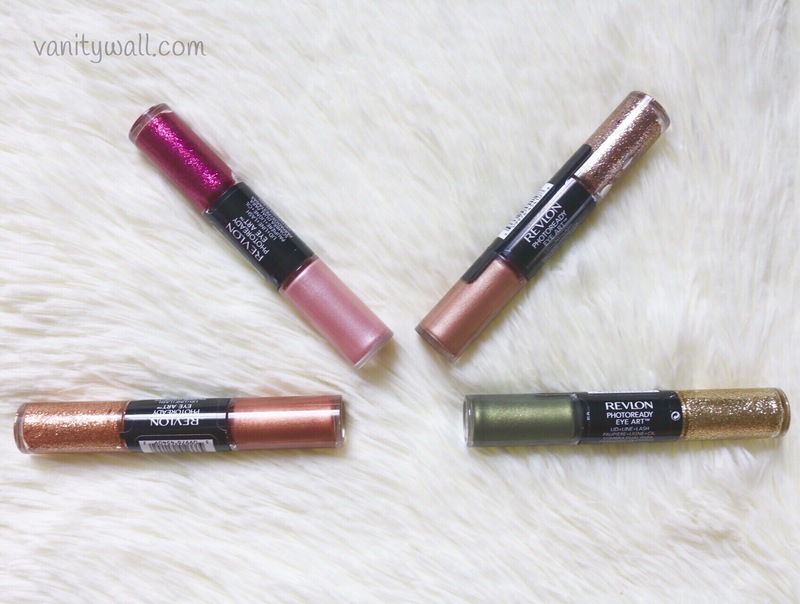 Today I am reviewing the Revlon PhotoReady Eye Art which is comes in a dual ended form similar to Revlon Nail Art Enamels. 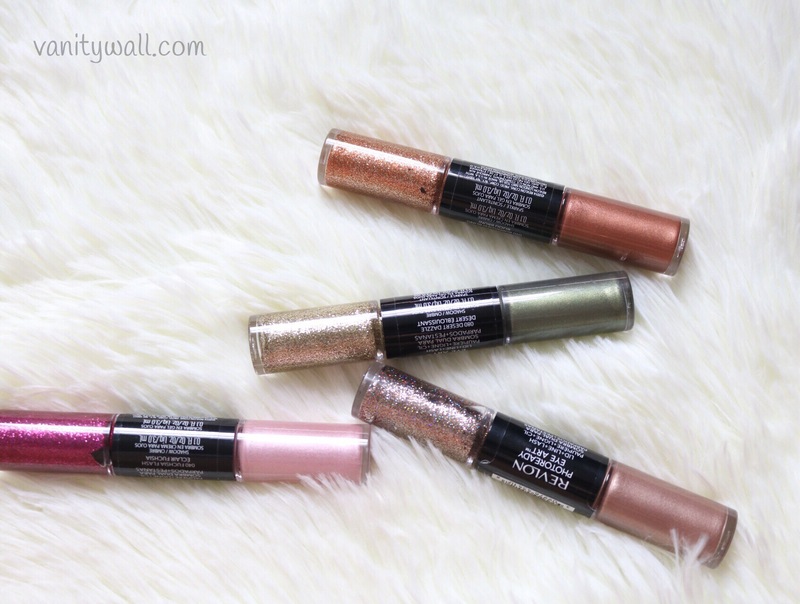 I have 4 shades – Burnished Bling, Desert Dazzle, Topaz Twinkle and Fuchsia Flash. Revlon Photoready Eye Art (Lid + Line + Lash) will help you create your unique look with ease. Coordinated shades and contrasting finishes make it easy to design an eye look that’s all your own. 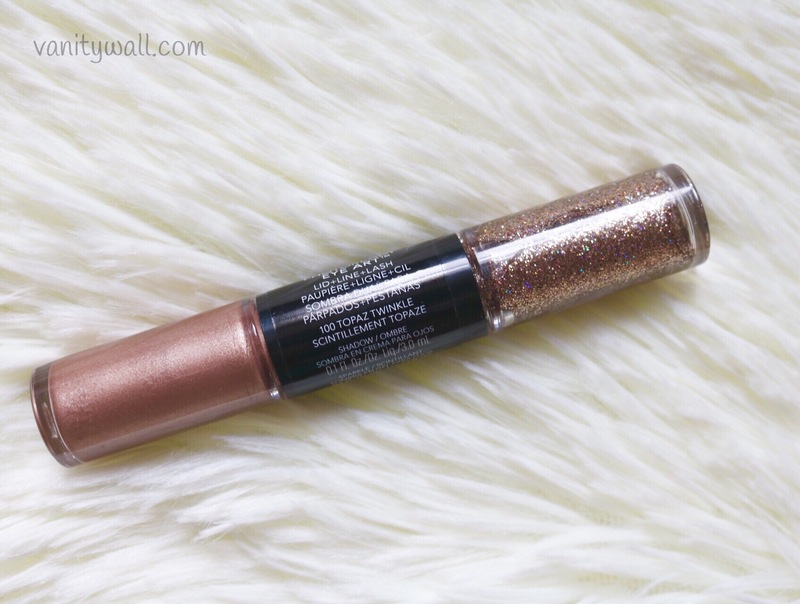 Dual-ended with an intensely pigmented cream shadow on one end, and a brilliant sparkle on the other. Cream shadow glides on effortlessly for smooth, rich color. Use the slim brush applicator to apply sparkle to the lid, as a liner or on the tips of lashes. Water, Acrylates Copolymer, Pentylene Glycol, Butylene Glycol, Hydroxyethyl Acrylate/Sodium Acryloyldimethyl Taurate Copolymer, Polysilicone-11, Propanediol, Tocopheryl Acetate, Niacinamide, Sodium Ascorbyl Phosphate, Isohexadecane, Xanthan Gum, Polysorbate 60, PPG-26-Buteth-26, PEG-40 Hydrogenated Castor Oil, Laureth-12, Silica, Ethylhexylglycerin, Tetrasodium EDTA, Phenoxyethanol, Caprylyl Glycol, 1,2-Hexanediol, May Contain:Mica, Titanium Dioxide (CI 77891), Iron Oxides (CI 77491, 77492, 77499), Carmine (CI 75470), Tin Oxide (CI 77861), Ferric Ferrocyanide (CI 77510)Aqua ((Water) Eau), Polyethylene Terephthalate, Acrylates Copolymer, Polyvinyl Alcohol, Polybutylene Terephthalate, Tromethamine, Ethylene/VA Copolymer, Propanediol, Panthenol, Acrylates/C10-30 Alkyl Acrylate Crosspolymer, Polyacrylate Crosspolymer-11, Polyurethane-11, Silica, Polyurethane-33, Butylene Glycol, Propylene Glycol, Trisodium EDTA, Phenoxyethanol, Methylparaben, Ethylparaben. May Contain: Mica, Titanium Dioxide (CI 77891), Iron Oxides (CI 77491, 77492, 77499), Yellow 5 (CI 19140), Blue 1 (CI 42090), Aluminum (CI 77000), Ferric Ammonium Ferrocyanide (CI 77510), Red 40 (CI 16035), Black 2 (CI 77266). 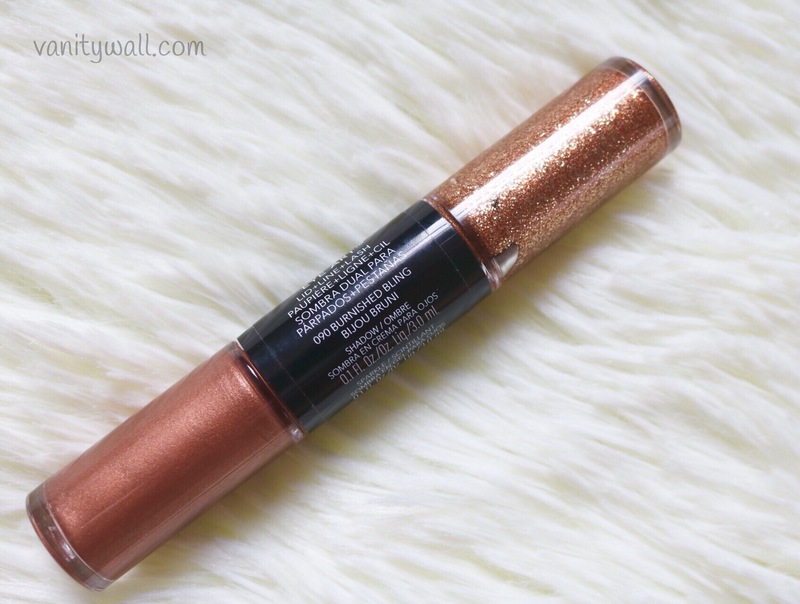 The Revlon Photoready Eye Art eyeshadow comes in a sleek dual ended form with one end housing a satin finish cream and the other with a sticky glitter. The packaging is definitely worth bonus points. The cream shadow end has a doe foot applicator and the glitter end has a synthetic pen brush type of applicator. The applicators are pretty effective in packing product onto the eye lids. Coming to how the eyeshadows fare, the cream shadow applies best with fingers. It’s easier to spread the shadow evenly on the lids with a fingertip. Brushes seem to pull most of the product into the brush hairs and sometimes ends up sliding the shadow around on the lid space causing patchy-ness. 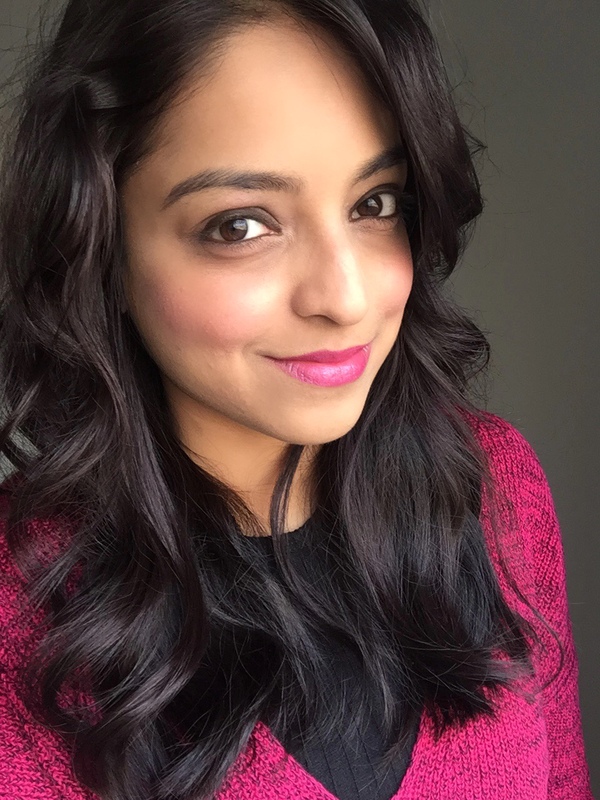 The cream shadow is quite liquid-y initially and takes a few minutes to dry up. So it is necessary to keep the eyes closed so that you don’t get the shadow in to your crease area or brow bone. Once dried, it won’t budge until you take it off with a makeup remover. So as soon as you apply the shade, blend it into the crease before it sets. It is waterproof and crease-proof. 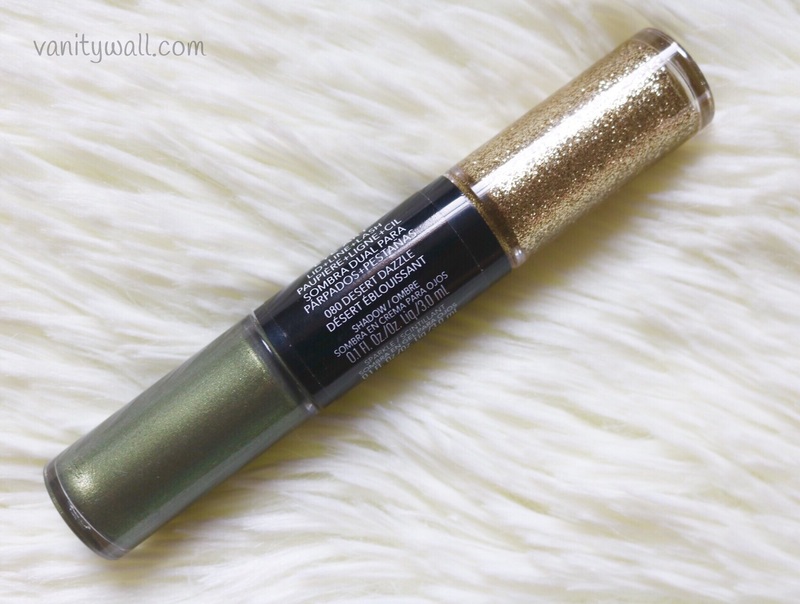 The glitter shadow has sparsely distributed glitter particles and is quite tacky in formula. This makes it easier to work with as there is no fallout. Just like the cream shadow, the glitter takes a few minutes to dry completely. Once dried it won’t budge. The pen brush end is narrowly shaped to get into inner corners easily as well as to line the lash line. However the formula doesn’t seem to be uniform across all the eye shadows. The shade Fuschia Flash applies very patchy on my lids. Brushes, sponge tips, finger tips nothing seem to work in getting this onto the lid space. It keeps moving around causing lots of patchy-ness. I’ve heard that this seems to be the case with 2 other shades as well – Gold Glitz and Black Brilliance. 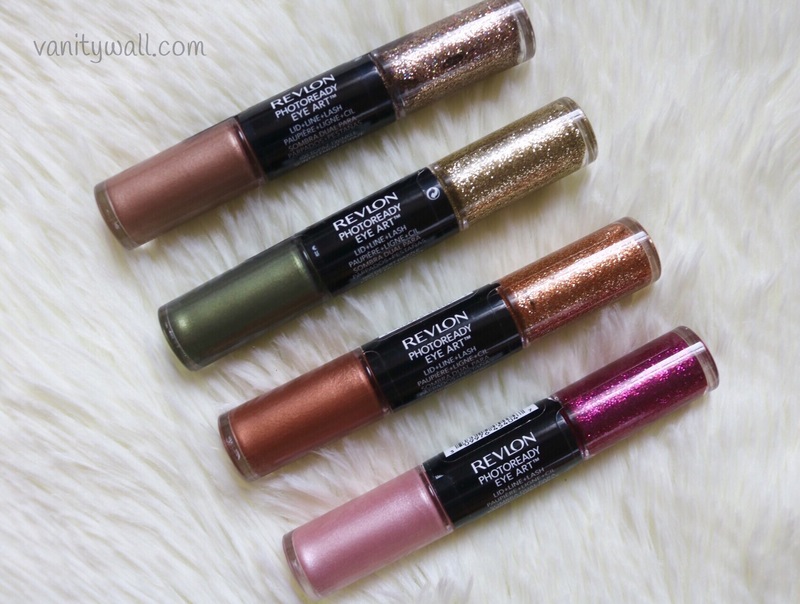 Overall these Revlon Photoready Eye Art eyeshadows are well designed with complimenting shades of cream and glitter to create party eye makeup looks easily without using a ton of different eyeshadows. These are usually on buy 1 get 1 at 50% off at Ulta. 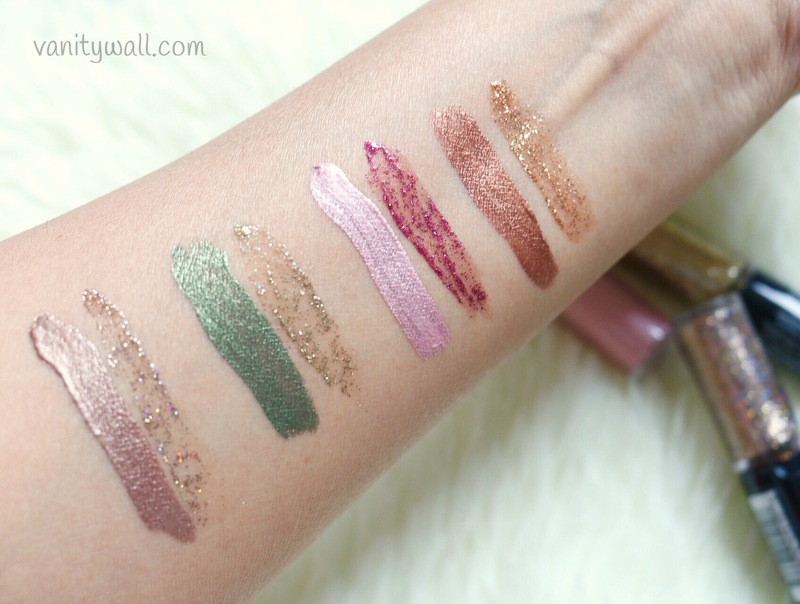 So definitely try these out, especially shades Burnished Bling & Desert Dazzle. 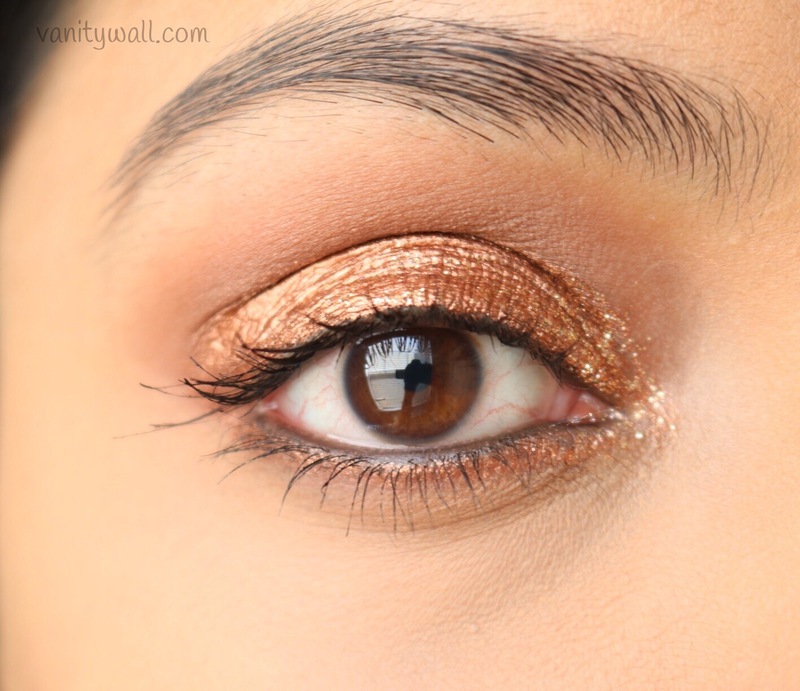 Here is the eye look I created using Burnished Bling – my favorite of the shades. 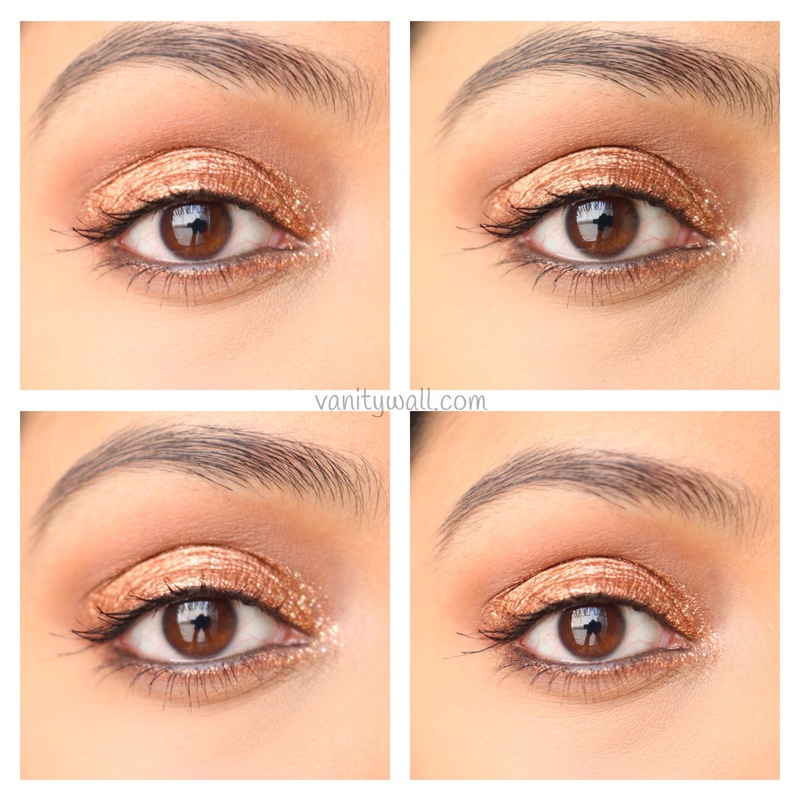 It is a beautiful sunset copper glittery eye look that would look absolutely beautiful on warmer skin tones. 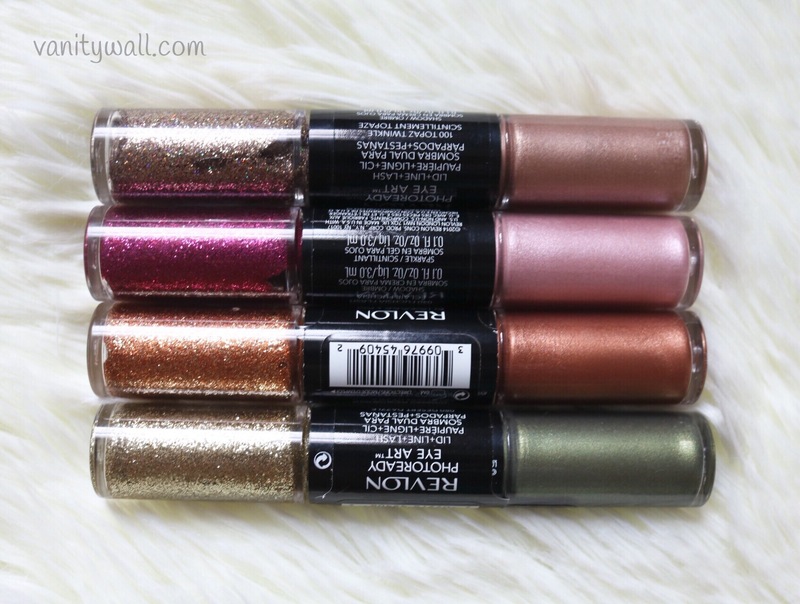 Revlon Photoready Eye Art eyeshadows are quite interesting eyeshadows in how they are packaged. 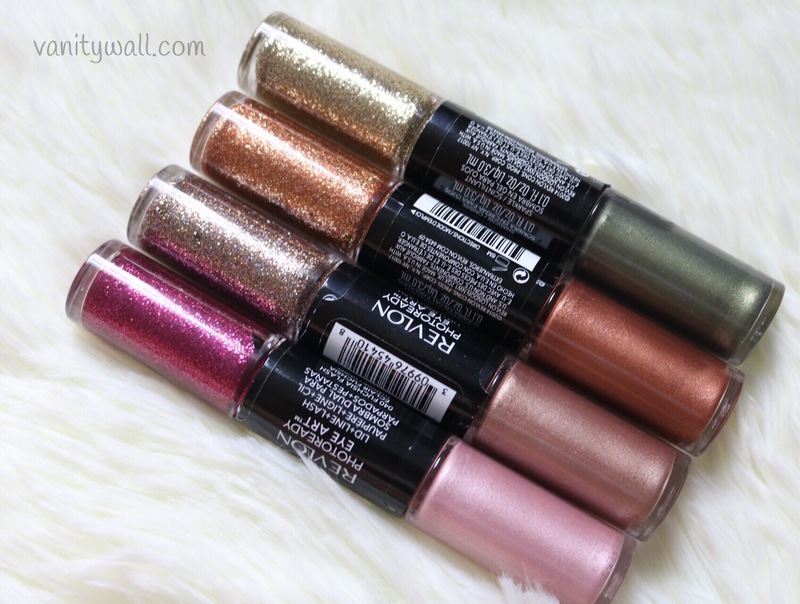 These come in complimenting shades of satin & glitter finishes to create vibrant party eye looks. Though the formula and texture tend to be not quite uniform across all shades, majority of them are really good. 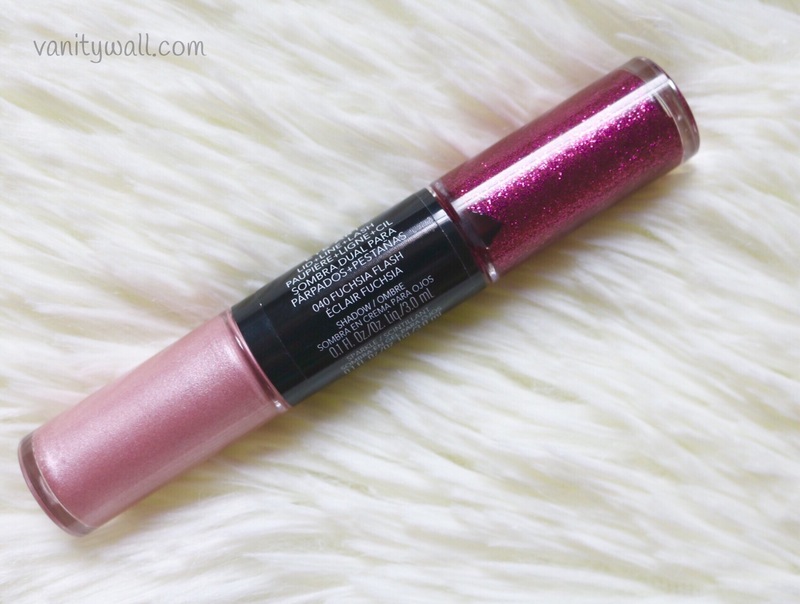 If not all I’d highly recommend trying out the shade 090 Burnished Bling. 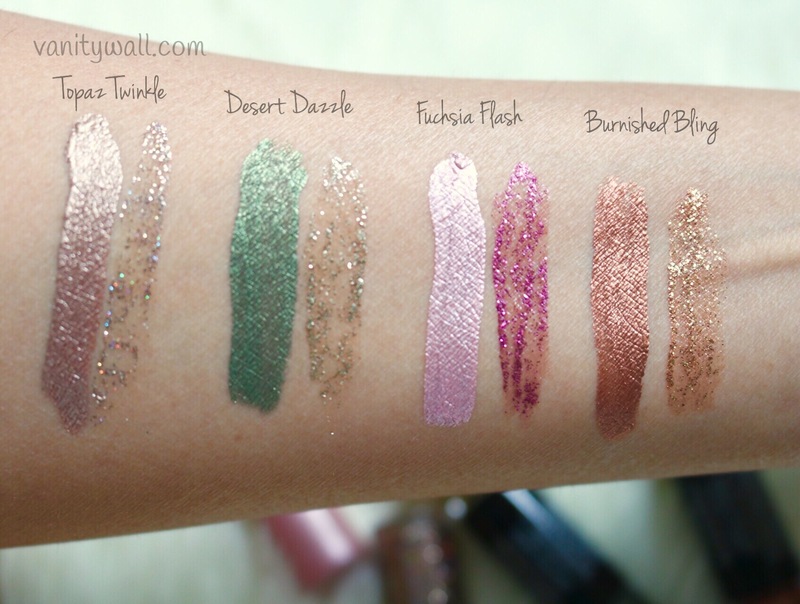 I love the shade Topaz twinkle. It looks so pretty. The 1st n the last ones r soooo pretty. Awesome post.